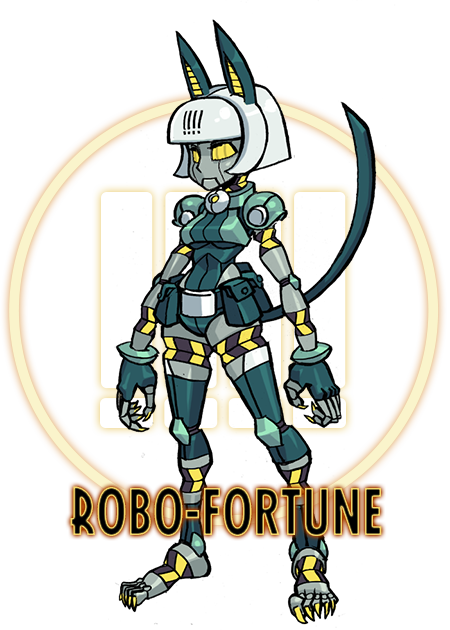 Robo Fortune is the creation of Brain Drain, the psychic director of ASG Lab Zero, and stands as a testament to her maniacal creator’s unmatched pride and petulance. Built to demonstrate loyalty and cunning, Robo Fortune fails to deliver either to any measurable degree. Employing cutting-edge technology, she sets out to hunt down the Skullgirl, and to engage in easily avoidable conflicts. Is the ASG Project’s latest creation the ultimate cybernetic soldier? Have Brain Drain’s mechanical machinations set the world on a treacherous path? Is Robo Fortune’s faulty programming more of a feature than a bug? Has science gone too far? !